The best cruising was the time spent in Glacier Bay. Did you know Glacier Bay is a national park? Further, it is a World Heritage Site, “the principal recognition given to natural and cultural areas of universal significance.” The only way to reach it is by boat or plane. When a cruise ship enters Glacier Bay they take on at least one Park Ranger, who gives a running commentary on what there is to see. Obviously, there are glaciers. Since these touch water, they are all “Tidewater Glaciers.” The park includes around 12 that calve into the bay. That was the downside to our time in Glacier Bay; we didn’t see any glaciers calve. I got lots of pictures of glaciers. Lots of water and ice and wildlife. It’s hard to convey the real beauty of the place and how awesome such big glaciers are with these little bitty pictures. Clicking on the picture above opens the slideshow. Take a look at the captions on the thumbnails before enlarging them. For some reason the captions didn’t carry over. Have I mentioned I’d love to go back? It was a thrilling ride. You can’t really relate to just how steep the railway is until you’re riding along and looking waaaaayyyyyyy down. A 10’ roadbed doesn’t seem very wide when a fall would be so far! Click on the picture to open the slideshow. I took a lot of pictures. The good news is the ones on the way up to White Pass turned out pretty well. The bad news is the ones I took from White Pass back down to Skagway were messed up, and every file read “Error”. That’s the first time I’ve had that happen in all the years I’ve been using digital cameras. And it’s the last time I buy a memory card from some unknown on eBay! Oh well! If I’d known, I wouldn’t have stayed out on that little platform outside the car freezing my fingers and other parts of my anatomy. I’d have sat in the much warmer coach car and just watched the sights go by. It’s another trip I’d do again in a heartbeat. 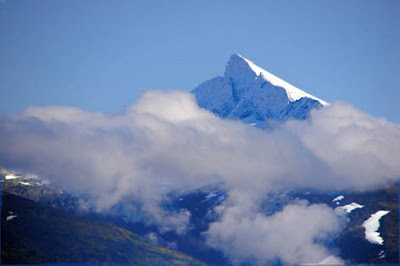 Going to Alaska was the fulfillment of a lifelong dream. Seeing whales in their natural environment was the fulfillment of a lifelong dream. September 18th, 2007 found me fulfilling both dreams. Combining the two made a day I’d repeat in a heartbeat if ever given the chance. This was the first shore excursion Dad and I took. And we got right back on the water! I think we both agreed it was one of the best excursions of the trip. Not surprisingly, I took more pictures on this day than at any other time. There were whales and seals and eagles and beautiful scenery just about everywhere you looked. It was almost a surreal experience; I just couldn’t believe I was really seeing all those things at last! I picked out 45 of the pictures to make this slide show – too many Kodak moments to choose between! If you’ve ever been to Alaska, you know how beautful it can be. As always, click on the picture above, and it will open a new page with the slides index page. The first picture is at the top left. There are 3 pages of slides, so don’t forget to move to the next one after you get to the last slide on a page. Most of the pictures were taken in the Auke Bay area, north of Juneau, Alaska. There’s a limit on the number of characters I could put on the captions, so I couldn’t get too wordy. The pictures will just have to speak for themselves! Also, though the little camera I was using doesn’t take the best videos, here’s one I took of the Stellar Seals, just to give you an idea of all the NOISE they were making. It’s an area rich in wildlife. And boy, I’d love to see it again! I have two days worth of pictures here. We were mostly just cruising the first couple of days. A pretty smart idea actually, because I suspect most people were tired from all the hurry and bustle of just getting to Seattle and boarding ship. These pictures are September 17th & 18th, as we were crusing the Inside Passage, headed towared Juneau. 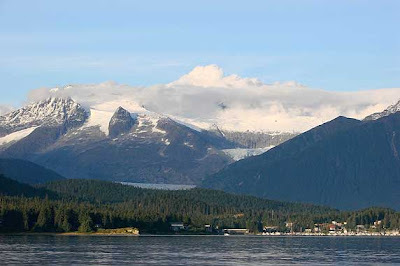 Day 3 we spent cruising the Inside Passage, and on Day 4 we made it to Juneau, Alaska. As in previous entries, just click on the picture above, and it will open a new page with the slide show. I would soooo love to see Alaska again! In this era of railroading, it was natural to think of building a railroad over the pass, but it was a daunting task. Blasting through granite, plus dealing with the steep slopes and deep snow, made it almost impossible. Because of the tight turns, a narrow gauge railway was built. The rails are just 3’ apart on a 10’ wide road bed, which also helped lower construction costs. Over 450 tons of explosives were used, mostly black powder. The ten million dollar project was the product of British financing, American engineering and Canadian contracting. Tens of thousands of men worked, sometimes in shifts as short as an hour due to the extreme cold, to complete 110 miles of track with cliff hanging turns of 16 degrees, with two tunnels and numerous bridges and trestles. The railway climbs from sea level at Skagway to almost 3,000 feet at the summit in just 20 miles and has grades of almost 3.9%. This is the northernmost railroad in the Western Hemisphere. 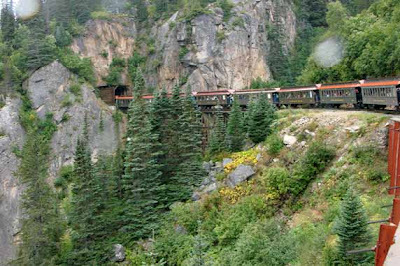 The White Pass & Yukon Route was designated an international Historic Civil Engineering Landmark in 1994. This honor is shared by only 36 civil engineering creations, such as the Eiffel Tower, Statue of Liberty and the Panama Canal. That’s the highlights of this railway’s rich history. It’s interesting to read about, and thrilling to ride. You can’t really relate to just how steep the railway is until you’re riding along and looking waaaaayyyyyyy down. A 10’ roadbed doesn’t seem very wide when a fall would be so far! The scenery is dazzling, with evergreens, mountains, snow and rivers. Bridal Veil Falls tumbles down a mountain far way, the bridges and trestles are awesome, and there’s even visible remnants of the trail used by the Stampeders. At the top, a little building is still there that was used by the mounted police. They turned back any Stampeder that didn’t have a ton of supplies, the amount deemed necessary to keep a man going for a year. There was just a lot to see and learn about. It was a thrilling ride!